While many luxury credit cards charge an annual fee, there is a vast array of top tier credit cards that offer ample rewards without an annual fee. In fact, these include some of the best credit cards around. Find low rates, cash back, and rewards with the best no annual fee cards from our partners below. See the best no annual fee credit card offers from our partners below. Credit cards without an annual fee offer much-appreciated savings, a hassle-free experience and other benefits, say experts. In fact, the majority of our picks for the best credit cards have no annual fee. "Yearly fees prevent consumers from buying what they really want," says Julie Pukas, head of U.S. Bankcard and Merchant Solutions at TD Bank. "Our 2017 Consumer Spending Index revealed that millennials spend nearly $300 more than the average respondent on dining, a total of approximately $2,000 annually. "Some consumers may save their credit card rewards points so that they can pay off their annual fee," says Pukas. "By switching to a card with no yearly fee, they can put those rewards to something they really want, like flights, dining out and more." Who should get a no annual fee card? An annual fee on a credit card is a charge made each anniversary year. An annual fee might be charged on a credit-builder card, a rewards card or a luxury card, for example. Typically, you are benefiting in some fashion for having the card, such as when it's a hotel or airline card. Annual fees can run as low as $25, which the Wells Fargo Secured card charges, to as high as $995, which the Mastercard® Gold Card™ charges. However, surprisingly few credit cards have an annual fee – only 26 out of 100 surveyed, according to a CreditCards.com study, and about half of the cards with annual fees waive that fee the first year. 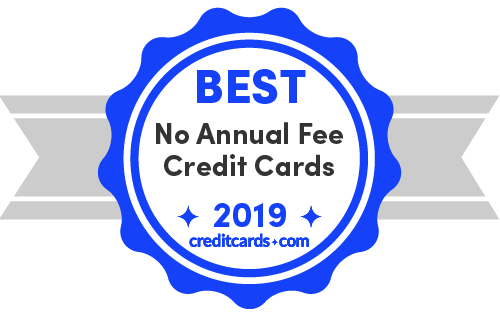 Heads up that no annual fee cards can be among the highest in other fees – of the 15 cards with the highest number of different fees, 11 had no annual fee. That said, among those cards with no annual fee, there are some standouts that offer truly impressive value – take a look at our favorites and let us know if you have any questions! This card's 1.25X miles for all purchases is augmented with 10X miles on hotels booked through hotels.com/venture. There's also a sign-up bonus of 20,000 miles after a $1,000 spend within 3 months, making it competitive with other travel cards without an annual fee. As a card with no annual fee and no foreign transaction fees, the VentureOne offers a ton of value. Bottom line: With an unbeatable rewards rate of 10X miles when booking and paying through hotels.com/Venture, the VentureOne is a favorite of frequent travelers. This card's double cash back feature is unique in that there is no sign-up bonus, but you can earn up to $600 at year-end. Here's how: Enroll in and max out the 5% rotating categories with $1,500 spend a quarter, bringing your cash back to $300 for the year. Then at the end of your first year of card membership, you earn another $300. With this card, you can redeem at any time. Also, the Discover cards offer Social Security number monitoring, making your identity that much safer. Bottom line: An excellent credit card for shoppers looking to maximize cash back, the Discover it Cash Back offers the twist of matching your cash back at the end of your first year. This card's straightforward flat-rate cash back on all purchases makes it easy to manage. In the first year, it's 3% cash back on up to $20,000 in purchases; after that, it's 1.5% cash back on everything. If travel is your thing, know that this card can be partnered with a Sapphire product, allowing you to get a 25%-50% bonus when redeeming for travel at Chase Ultimate Rewards. Bottom line: The Chase Freedom Unlimited is the trifecta – it's a cash back card, a card with travel benefits, as well as a solid credit card for balance transfers, with 0% intro APR for 15 months on purchases and balance transfers (then 17.24% - 25.99% variable). The Quicksilver goes toe-to-toe with other top flat-rate cash rewards cards, providing 1.5% back on all purchases and no annual fee. Its sign-up bonus is on par with competing cards, with $150 to be earned for spending $500 in the first 3 months. There's also no need to worry about foreign transaction fees. Bottom line: The Capital One Quicksilver is a no hassle, no frills credit card that's perfect for credit card beginners and first-timers. The Wells Fargo Propel American Express Card is among our top cards for a simple reason: it offers the most value. The size of its sign-up bonus (30,000 points, redeemable for $300, after spending $3,000 in your first 3 months) is more typically found among credit cards that charge an annual fee. The same can be said of its strong 3X rewards on travel and dining. Bottom line: The Wells Fargo Propel card is leaps and bounds above the traditional options in the no annual fee category. This card features a 10% anniversary bonus on all cash rewards earned each year, which is one of a kind. The HSBC Cash Rewards Mastercard delivers a relatively non-traditional approach to the sign-up bonus. Instead of tying a specific bonus to a required spend, the card offers 3% cash back on all purchases with the first 12 months until $10,000 in spend is reached. For those looking for strong, reliable cash back the HSBC Cash Rewards credit card provides a very enticing offer. Bottom line: For cash back on no annual fees, HSBC's offering rivals the Chase Freedom in earnings rate along with its 0% intro APR period on purchases. The SavorOne lets you enjoy cash back on dining, entertainment, and groceries without the hassle of an annual fee. Dining and entertainment earn 3% cash back while groceries earn 2% cash back and other purchases earn 1% cash back. There is a healthy sign-up bonus of $150 if you spend $500 in the first 3 months. Bottom line: The SavorOne is a great option for anyone who likes to dine out or order in, rivaling cards like the Uber Visa® Card. The BCE excels at cash back at everyday purchases, offering 3% back at U.S. supermarkets and 2% back at U.S. gas stations and select U.S. department stores. As such, it should be the go-to card you pull out when you reach the checkout line at your local U.S. supermarket. Just keep in mind that there is an annual limit of $6,000 in supermarket purchases on which the 3% cash back rate will apply; after you hit this limit, you'll earn 1% back just as you would on general purchase. However, this limit should be more than sufficient for most people. Bottom line: The king of cash back at U.S. supermarkets, this card is a must-have for every family. The Cash Rewards card offers 3% back on one category of your choice (out of 6 possibilities that include gas and online shopping) and 2% at grocery stores and wholesale clubs for the first $2,500 in combined purchases each quarter. The sign-up bonus is $200 after a $1,000 spend within the first 90 days of card membership, which is a relatively low spending requirement. Bottom line: Comparable to everyday spending cards like the Blue Cash Everyday from American Express, the Cash Rewards card offers even more benefits, such as up to 75% redemption bonus for Bank of America clients with Preferred Rewards status. The Cash+ is a great card if you want to keep your options open. It affords a large degree of flexibility since it earns 5% cash back on 2 categories of your choice up to the $2,000 quarterly limit and 2% cash back on another "everyday" category of your choice. The sign-up bonus is competitive at $150 for spending $500 in your first 90 days. Bottom line: As a credit card with highly customizable rewards, the Cash+ card is a strong choice for cardholders who prioritize cash back. When are no annual fee cards worth it? When are cards with annual fees worth it? Would a cashback card suit your needs? Most cashback cards offer no annual fee, yet they can have sign-up bonuses of up to $200, such as the Wells Fargo Cash Wise, and a couple offer 5% rotating categories, such as the Chase Freedom and the Discover it Cash Back (enroll each quarter to earn 5% cash back on up to $1,500 in purchases made in various categories throughout the year). Are you primarily interested in building credit? If you aren't going to be putting much on your card each month, and are focused on building credit, it might be a good idea to pay in full each month ahead of the due date with a card that doesn't have an annual fee. That's just one less fee to worry about. Would waiving the fee make it worth your while? If you are interested in a card with an annual fee, but you don't relish the idea of paying up each year, consider asking for the fee to be waived. Surprisingly few people do this, according to our polling, yet most who ask, get what they want. If the annual fee is waived. Sometimes, cards with annual fees waive the fee the first year of card membership, maximizing your savings. If you plan to spend a lot. Every card has a threshold that can make it worth your while to get a card with an annual fee. If the sign-up bonus is generous. Cards with annual fees can have superior sign-up bonuses, such as the Chase Sapphire Preferred, with its 60,000 points after a $4,000 spend within the first 3 months of opening your account. If the ongoing rewards are particularly rich. The rewards for a card with an annual fee may be stronger than those with no annual fee, such as the Blue Cash Preferred's 6% back on U.S. supermarkets on up to $6,000 a year (then 1%); and 3% on U.S. gas stations and select U.S. department stores. If the benefits are excellent. Look at the benefits of the cards you are eyeing, such as free first checked bag, free late check-out or an annual airline fee credit, such as the $100 annual airline fee credit of the American Express® Gold Card. No ongoing charge. If you pay on time and in full each month, you can avoid late fees and interest charges, as well as no annual fee if that is a feature of the card. Good for the long term. If it's a card you plan to keep beyond the first year, but not one you plan to use aggressively, then a no annual fee card can be a good choice. A variety of types of cards. No annual fee cards can belong to categories like cash back, balance transfer, travel, and more. Good for small amounts of spending. If you don't plan to be a big spender with your card, you don't need a card with richer rewards, which often come with an annual fee. Nice rewards. No annual fee cards can offer 2% back flat rate, 5% back on select categories, $150 sign-up bonus and more. A no annual fee credit card is great for someone who is looking for a good balance transfer card, trying to build credit or wants a rewards card without the hassle of an annual fee. With a balance transfer card or 0% APR card, you avoid interest charges for a limited time – this may be a card you don't plan to use much in the future, so an annual fee isn't wanted. Cards without annual fees can also be easier to get, because they sometimes require a lower credit score. If you need a secured card or a card for bad or fair credit, you'll want to see if there is an annual fee, which can be another cost when cash is short. Also, while many rewards cards have annual fees, there are some without one, which is ideal if you don't plan to use the card extensively. Finally, these cards can be great for building your credit, particularly when you pay in full and on time each month, thereby keeping your balance low. If you've committed to a card with an annual fee and now you're feeling a bit trapped, there are actually ways to get out of the annual fee without harming your credit. If you're unsatisfied with the card and perks, instead of closing the card, call the card's issuer and request a product change to downgrade to a card with no annual fee, advises Chelsea Hudson, personal finance expert with TopCashback.com. This will allow you to skip the annual fee without affecting your credit score. If you want certain benefits of the older card, such as the credit limit, you'll want to stay within product groups. So, for example you wouldn't transition as a downgrade from the Chase Sapphire Reserve to a Southwest card, although you might downgrade to a Chase Sapphire Preferred Card. When you downgrade, everything transfers to the new card, including account number, credit line, payment history, even length of time you have had the card active. The payment history and length of history are particularly important, because those impact your credit, and by retaining these with a product change, you keep them beyond 10 years on your credit file. Also, by maintaining the credit line, you keep your credit utilization ratio low, provided your balances are low, which is another important part of maintaining a healthy score. If you are carrying a high balance, a balance transfer card without an annual fee can be a good choice, says Michael Tamez, investment blogger with Sunshine Gold Investments. If you don't use your credit card often, and the annual fee is eating you up, the switch to a card with no annual fee may be the best option. If you want the benefits without the fee, says Ben Luthi, financial expert at Student Loan Hero. While you won't get a lot of the same perks that you'd get with a premium credit card, you can still get benefits like a 0% APR promotion on purchases and balance transfers, no foreign transaction fees, price protection, and rental car insurance. If your wallet is weighed down with cards, closing the card with an annual fee can be an option. You'll want to pay off any debt (don't just transfer it to another card) and make sure you don't have high debt in your combined cards, because that can impact your credit utilization ratio, and therefore, your credit score. Also, think twice before closing an older card, because your oldest card and your average age are factored into your credit. There's another little-known option – simply ask your issuer to waive the annual fee. The answer may surprise you. In fact, we found that 70% of consumers who asked successfully had their annual fees waived or lowered. Cards with annual fees frequently come with better sign-up bonuses and ongoing rewards, as we'll show you. But then, there is the plus of not having to pay a fee year after year. Here, we compare 2 sets of cards from the same card issuers and even similar names. But heads up, the rewards vary even if the benefits are similar. As you can see, while the Venture cards have similar benefits, the Blue Cash products vary in the 0% APR offer, so it's worthwhile to read the fine print. Which is better: annual fee or no annual fee? While cards with annual fees often have superior benefits, money can be saved with a card that has no annual fee. You can save money by avoiding an annual fee if you don't plan to spend too high of an amount. For example, with the Blue Cash Everyday, which has no annual fee, and the Blue Cash Preferred, which has a $95 annual fee, with a $3,200 spend at U.S. supermarkets, the Blue Cash cards come out within a penny of each other. If you spend less, the Blue Cash Everyday is worth your while. If you spend more, then the Blue Cash Preferred is the best pick. Take another example. The Capital One Venture Rewards has a significantly higher sign-up bonus than the Capital One VentureOne Rewards – 50,000 miles as opposed to 20,000. Also, the $95 annual fee for the Venture Rewards is waived the first year. But what about after the first year? So, you see that the VentureOne Rewards is worth your while if you plan to spend less than $12,750 a year after the first year. From credit-builder cards to cash back products, there are myriad credit card options with no annual fee. Do you want rewards for everyday spending? Some cards will give higher rewards for everyday categories such as groceries and gas. Is there a sister card? If so, there might be one with a waived annual fee the first year, such as the Capital One Venture Rewards, while the Capital One VentureOne Rewards has no annual fee. If you plan to spend a fair amount each year, the card with the annual fee may actually be the better choice. What about partnering cards? With the Chase Ultimate Rewards cards, you can pair up select products, transfer points to cards that have boosted rewards, and use the points toward travel. For example, you can do this with the Freedom cards (no annual fee) and the Sapphire cards. More on that later. Do you want to set it and forget it? These cards are great for using the card without thinking about it – they can be up to 2% cash back, such as the Citi Double Cash Card (1% when you buy plus 1% as you pay), with no annual fee. Do you want to chase rich rewards? The Chase Freedom and the Discover it Cash Back, both with no annual fee, offer quarterly rotating categories of 5% back. Be mindful of the requirements though, because with these cards, you have to activate to sign up for the new bonuses each quarter. Also take note that both cards' 5% cash back only apply up to $1,500 in purchases in the quarter's categories. What about a sign-up bonus? Many no annual fee cards come with sign-up bonuses, even up to $200, as with the Wells Fargo Cash Wise. Or you instead might get double cash back at the end of your first year, as with the Discover it cards, or double your cash when you pay your bill, as in the case of the Citi Double Cash. You've practiced on your no annual fee card, and you feel you have this rewards thing down. Now it's time to think more strategically. It's time to look at pairing cards. While a no annual fee card can have great cash back rewards on all spending or even specific categories, it may not have the outsized rewards of a travel card. With a travel card, you can get travel and purchase benefits, travel credits, even credits with Uber – all things you likely won't get with your cash back card. But if you play it right, you can use the cash back, no annual fee card for, say, all spending, and use the travel card to get a sizeable sign-up bonus with your favorite hotel or airline brand, as well as outstanding ongoing rewards for that brand. For example, the Wells Fargo Cash Wise will earn you 1.5% back on all purchases, while the Chase Sapphire Preferred gives you 2X points on travel and dining. Simply use the CSP for those purchases and the Cash Wise for everything else. In addition to the ongoing rewards, the Sapphire Preferred card will earn you 60,000 points after a $4,000 spend within 3 months. When pairing no annual fee cards and annual fee cards, there is no comparison when looking at the Chase cards. Through the Chase Ultimate Rewards program, you can get the added travel bonus points of the Sapphire cards. In fact, the Sapphire Reserve, delivers a 50% bonus on points when you redeem for travel through Ultimate Rewards. Then there are the Freedom cards. While you can't earn an Ultimate Rewards bonus with the fee-free Freedom cards, you can match them up with Sapphire cards and transfer the Freedom rewards, use them toward travel, and get the boost that way. Check out our reviews for no annual fee cards to explore more credit card offers that waive that cost every year.